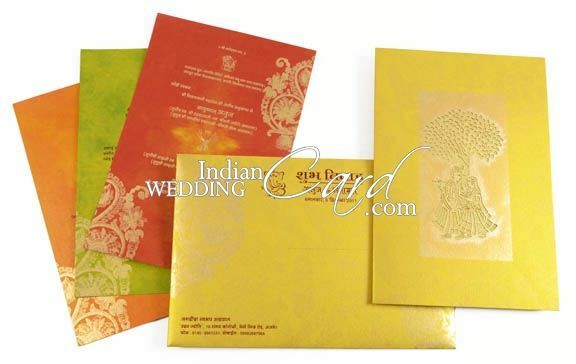 D-5680, Yellow Color, Shimmery Finish Paper, Laser Cut Cards, Hindu Cards, Designer Multifaith Invitations, Exclusive Invitations. The front has a large Radha Krishna picture cut in laser with gold self-textured paper making the base. A floral pattern is printed all over the card and envelope. Inserts are multicolor in hues of 3 shades namely Red, Green and Orange. Inserts and envelops also have ornamental border in gold. 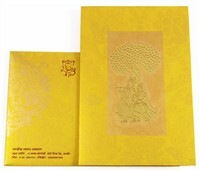 Gold color shimmery paper (300gsm) for card, inside left, 3 multicolor inserts and mailing envelope. Silk Screen Printing in gold and deep red color.